Apparently, you are confused in deciding whether to buy an entry-level DSLR camera or a mirrorless camera right now. More specifically, you are confused in choosing between Nikon D5300 vs Sony A6000 right now. Thanks to the advancement of technologies, many mirrorless cameras are now able to compete against DSLR cameras. Mirrorless cameras offer much more compact and lightweight bodies than their DSLR counterparts. Speaking about portability. They also offer decent image quality. 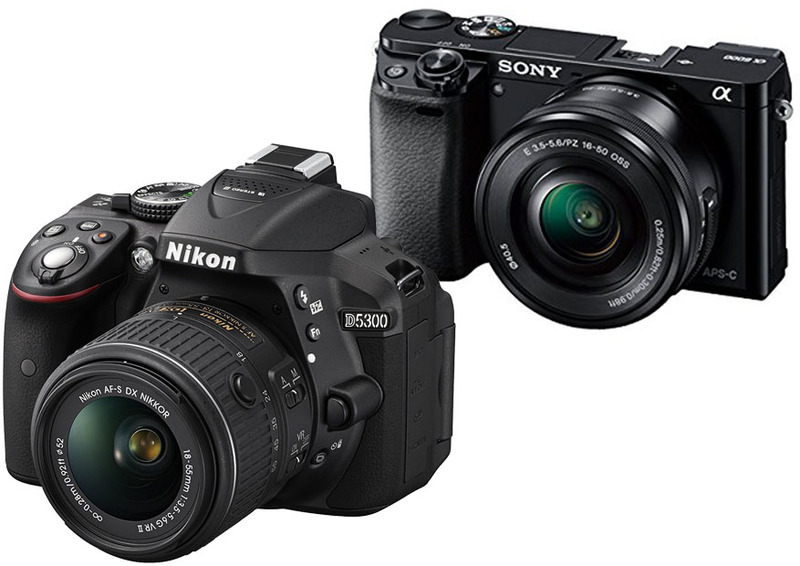 So, is there any reason to choose the entry-level DSLR Nikon D5300 over Sony A6000? Below, we will discuss about the key differences between Nikon D5300 vs Sony A6000 to help you decide which camera has the best value for the money. Continue reading! Of course, if portability is a top priority in your list, Sony A6000 is definitely the way to go. After all, mirrorless cameras are preferred over DSLRs mainly due to the compactness and lightness. 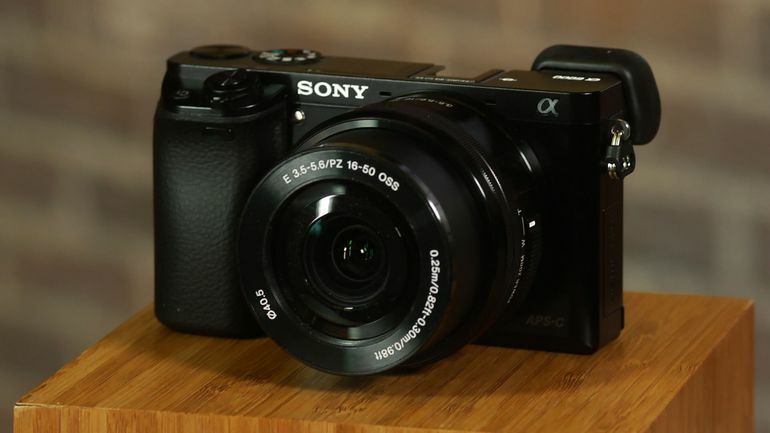 Sony A6000 is noticeably smaller and slimmer with the dimensions measuring 120 mm x 67 mm 45 mm. It weighs about 344 grams. Sony A6000’s body is highly streamlined and efficient. There is no unnecessary curve. The grip area on the right side is textured, and the grip feels nice and solid. There is a dial control on the top for quick access to essential features. On the rear, you can find a three-inch display screen along with an electronic viewfinder. The display screen can tilt, which is nice. Unfortunately, it cannot fully rotate, so it cannot be used for selfies. On the other hand, just like Nikon D5300 vs D7000, Nikon D5300 is a DSLR camera. It is quite bigger and bulkier. The dimensions are 125 mm x 98 mm x 76 mm, and the weight is about 480 grams. But, if you are already used to DSLR cameras, you will probably find the handling more familiar. It also feels solid. On the rear panel, you can find a 3.2-inch fully articulating display screen and an optical viewfinder. Sony A6000’s electronic viewfinder is better than Nikon D5300’s optical one in several ways. Of course, as an electronic viewfinder, it provides WYSIWYG image preview. What you see on the display is very close to the result. In addition, it also has 100% coverage. You can see full, more accurate image preview. However, an electronic viewfinder usually has a short input lag between the action in front of you and what you see. Hence, you can choose Nikon D5300 if you prefer to stick with an optical viewfinder, which does not have such input lag and comes with much better image brightness and clarity. The next thing that you should consider when choosing between Nikon D5300 vs Sony A6000 is the autofocus. At first, Sony A6000 seems to have an awesome autofocus system, featuring 179 focus points. In addition, it also has focus peaking, which is a very nice feature. However, the performance is only great for shooting static and slow-moving objects. It struggles to follow fast-moving objects, even though it is indeed among the top performers of mirrorless cameras. 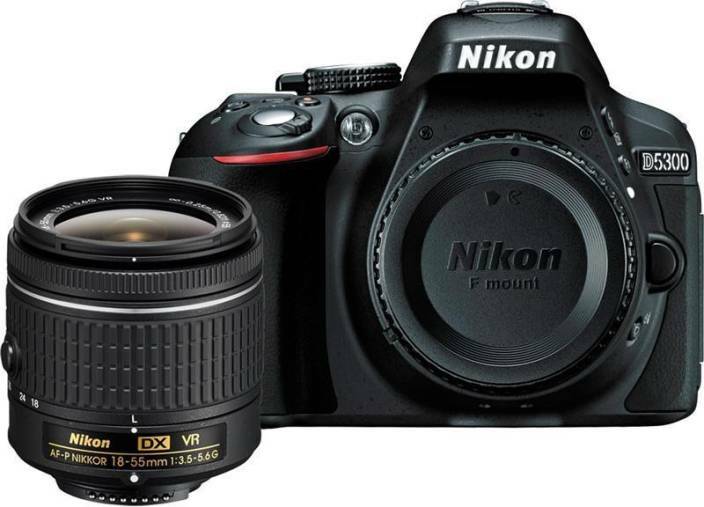 Nikon D5300 is a DSLR camera, and the AF is quite faster and more powerful. Even though it only has 39 focus points, it is more suitable for tracking and shooting fast-moving objects. It lacks focus peaking, but you can attach an external display via HDMI if you really need focus peaking. The next thing that people usually consider when choosing between Nikon D5300 vs Sony A6000 is the lens. The big argument that people usually express in favor of Nikon D5300 is that Nikon has much better lens selections. Nikon D5300 has the Nikon F lens mount. Of course, Nikon lenses are excellent and better than Sony’s lenses. However, we should also note that Sony A6000 comes with the Sony E lens mount, which is “more versatile” in a sense that you can pair it with adapters to make it work with not only Sony lenses but also Canon and Nikon lenses! Both of these two cameras are equipped with 24 MP APS-C CMOS sensor. However, Sony A6000 offers better ISO range and continuous shooting speed. The ISO range is 100 – 25600, expandable to 51200. The continuous shooting speed is 11 fps. Furthermore, Sony A6000 also offers better AE bracketing with a range of plus-minus 5 EV. However, the overall image quality is not as great as Nikon D5300. Sony A6000 somehow produces more moire, though it is definitely not a terrible one. The colors are also less vibrant. On the other hand, Nikon D5300 has an ISO range of 100 – 12800, expandable to 25600, and a continuous shooting speed of 5.0 fps. This DSLR camera offers better overall image quality. It has less moire, and the colors have better dynamic range and contrast. The shots appear more vivid. Both models record videos in Full HD (1920 x 1080), but Nikon D5300 has the better edge for videography because it has a microphone port. You may want to use an external microphone in order to capture high-quality audio with decent clarity. Both models have built-in Wi-Fi for easy file transfer. But Sony A6000 does not support smartphone remote control. Nikon D5300 can be controlled remotely via a smartphone, and it also has built-in GPS. If you are planning to bring your camera on a long trip, you may want to get something with long battery life. You probably want to choose Nikon D5300, which has much better battery life. It can capture up to 600 shots on a single charge. On the other hand, Sony A6000 can only take up to 360 shots on a single charge. If you prefer a compact, lightweight, and portable camera, Sony A6000 is the way to go. However, if you don’t mind the bulky size, Nikon D5300 is generally the best choice for the money. It offers a more powerful AF as well as better overall image quality. The optical viewfinder is also a reason to choose this DSLR. In addition, it also has more built-in features and longer battery life.